James Gunn Norquay and his wife Catherine Isbister. My name is Bruce Norquay; I am the grandson of Gordon Norquay, of Quoyness, Flotta. My grand-father Gordon emigrated to Australia in the early part of the 20th century. The photograph, shown on the left, is of his parents, my great grandparents, James Gunn Norquay and his wife Catherine Isbister. 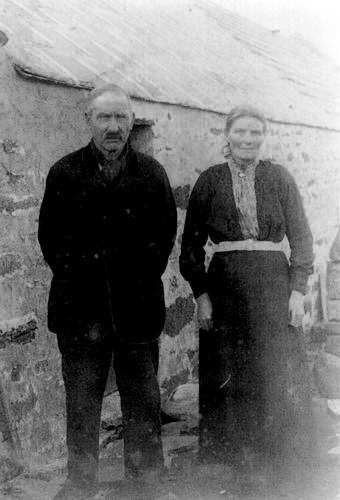 The photograph was taken outside of a stone cottage which I believe was on Flotta. Grandfather’s brother, William, was killed in France in 1918 and Grandfather being William’s only next of kin in Australia inherited his house, which became the family home. The property is located in the Sydney suburb of Artarmon. Gordon Norquay worked for the Adelaide Steam Ship Company, and in 1937 he was fatally injured on board ship and died.He is buried at Port Lincoln, South Australia. My father, William Thompson Norquay, convalesced on Flotta after being repatriated from a German prisoner of war camp in 1945/46. He was in a pretty bad state apparently with ulcerated legs due to a wound and continual deprivations he incurred. I am sure his stay on Flotta was planned so he could be nursed back to full health by family members before his return to Australia. Apart from that I know nothing of the Norquay’s early life on Flotta. Unfortunately all of dad’s generation has passed on. I do know however that they were all very spirited individuals. I personally believe that we all stand on the shoulders of these great men and women and I would like their stories and lives recorded. I had the pleasure of meeting Sally, my second cousin, when my wife and I traveled to Orkney in 1984. She is a really nice person. I was amazed to meet her and her dad, my great uncle Norman, before he passed away. They showed us the family bible which we photographed, which records all births, deaths and marriages of James Gunn Norquay’s extended family. Submitted by their great grandson: Bruce Norquay, Australia. This entry was posted in Flotta Folk by S. M. Hewitt. Bookmark the permalink. I visited Orkney and Flotta last year and loved it and I have a lovely photo of me hugging the elder Gordon Norquay’s gravestone. I forgot to mention that I took photos of the memorial in the church on Flotta and there is a handsome photo of your grandfather’s brother William Norquay of the Australian Infantry who died in WWI. Sorry I can’t upload it to this site. Hello Lorraine, I have just looked again at this site and seeing your text gave me great excitement. Bruce, who is the one that has added this photo of our Gr Grandparents James and Catherine Norquay must not have seen your post… You are correct in believing we would be related as Gordon Norquay Gr Gr Grandfather to all of us is that link. Most Exciting!!! I myself live in Australia and have also visited the Orkneys & Flotta’s Kirk… it was so exciting for me as I was unaware that we had so many relatives still residing in The Orkneys… My hope is always to return. I would love to have Benjamin’s Family tree. Lovely to hear of you… Sorry it has been so long..
From this site I also connected with another third cousin through ‘my Benjamin line’ and we met up in Inverness last year. It was quite wonderful. When I saw her and her father (2nd cuz, once removed), I could see they had the same eyes as my grandmother and we ‘felt’ like family members. It was a good experience. Hello Bruce! I believe the photo is of my great, great grandfather. My father is James Gunn Norquay DOB 4th August 1948; his father was also James Gunn Norquay, who died in Aberdeen in 1967. My great grandfather, again – James Gunn Norquay (!) http://www.rbls-kirkwall.org.uk/memorials/Flo/JamesGNorquay.pdf – the son of the pictured above James Gunn Norquay and Catherine Isbister. I can be contacted at sheenalouisenorquay@gmail.com – would love to connect.